Support Hot Science – Cool Talks! 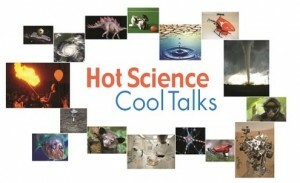 Hot Science – Cool Talks bring leading scientists and engineers to communicate their research to the public and the local K-12 educational community. Free and open to everyone, Hot Science – Cool Talks are much more than just a lecture. Before each talk exhibitors and groups from the university and throughout central Texas put on an interactive science fair offering hands-on activities and demonstrations. Hot Science – Cool Talks are are immersive educational experiences the whole family can enjoy. Please take a moment to support Hot Science – Cool Talks via our crowd sourcing campaign: http://hornraiser.utexas.edu/HSCT. Together we can continue to provide engaging science experiences to the community.